It will be seen that, with the exception on the final X on the obverse of Speed’s engraving, the legends conform exactly. The engraver has moreover differentiated the two types of the letter d and D, and does exactly reproduced the cross and pellets on the obverse and has meticulously place all the pellets on the reverse, including the three below the exergual line and the single one by the head of the spear. The difference arise from the ‘improvement’ of the bust and the figure on the reverse and from the addition of the final X to the obverse legend. This is one of the weaker parts of the coin and, though we have no hesitation in saying that there is no X, it would not have been unreasonable for a seventeenth-century engraver to have imagined one in order to complete the word he assumed to be REX. We feel confident therefore that Speed’s engraver had before him a piece similar to the one recently found and, as no other specimen has been recorded, probably it was this very piece. The oldest recorded use of the PENDRED name may be a gold coin of King Offa. This Anglo-Saxon king ruled part of Britain between 757 and 796. It is known as the PENDRED coin, is kept at the British museum in London. (ref 1962.0313.1). Struck in gold between 787 & 792 A.D. by a moneyer known as Pendred who (as was known at the time) put his name on the reverse side of the coin. Styled on a Roman ‘Aureus’ of Augustus issued at Lugdenum in Spain in 14-12 BC. (BMC 488). The Pendred coin weighs 3.748 gm and is approximately 19mm in diameter. A copy of C. E. Blunts & Michael Dolley’s paper ‘A coin of the time of King Offa’ is included herewith. bust to the right in high relief; cross made of five pellets in front of neck. PEND RED Standing figure facing right, holding a spear in right hand and resting left hand on a bow(? ), which stretches to the ground. Wt.57.8 gr. : 3.748 gm. Die-axis. 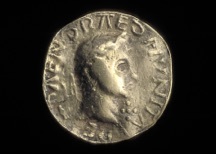 The obverse of this shows a diademed bust of Augustus comparable to the diademed bust on the Pendred; the reverse shows a standing facing figure of Diana, with her head turned to the left, holding a spear in her right hand and a bow in left stretching to the ground. By her side is a dog. The Pendred piece shows an approximation of the figure, the spear, and an object that could well be a bow, but omits the dog. The similarity is striking. The head is turned to one side, the right arm crooked, the figure wears a short tunic coming down to the knees, and stands on an exergual line. It would seem that this aureus was the prototype. Miss Anne Robinson has kindly looked through her records of hoards of Roman gold found in this country. The only one published as coming from Lugdunum coins of Augustus was from a 1957 Bredgar find where eleven aurei of this emperor are of this mint. Isolated finds have been made, but the records have not been collected and so far we have not traced one instance of the actual prototype being found in this country. That the type was probably known here, either in gold or silver – for the Roman coin is found in both metals is, however, suggested by a silver coin of Cunobeline, to which Mr.D.F.Allen has kindly drawn out attention, the reverse of which he considers derives from the same Augustus type. What is the prototype of the Pendred piece? The Pendred coin is clearly derived from a Roman type both as to obverse and reverse and Dr.J.P.C. Kent has kindly examined the potential prototypes and has referred us to an aureus of Augustus, issued at Lugdunum in 14-12 B.C. (BMC 488,RIC 329). We deal with these questions. - The piece was known to Speed in 1611. - It was originally in the Cotton collection but had been lost by 1772. At first glance, the differences between Speed’s engraving and the newly discovered piece may be more apparent than the similarities. But closer inspection reveals the fact that the similarities are significant and that the differences could have easily resulted from the well known practice of engravers in the seventeenth and eighteenth centuries of ‘improving’ coins for the purpose of illustration by drawing in detail no longer visible on the original but which they believe formerly to have existed. In John Speed’s History of Great Britaine, published in 1611, in the Section dealing with ‘opposers of the Saxons’ and at the head of the part devoted to ‘Uther Pendragon’ is an engraving of a gold coin reading PAENDRAED which Speed attributed to him. The coin is ignored in Gibson’s edition of Camden’s Britannia, 1695, in which Obadian Walker deals at some length with Ancient British and Anglo-Saxon coins to which he devotes six plates, a number of the coin illustrated being derived from Speed, and it must be assumed that Walker mistrusted Speed’s attribution. Walker says, however, that the coin he illustrates from Speed were in the Cotton collection. The next published reference to the Pendred coin that we have found is in Samuel Pegge’s Assemblage of Coins fabricated by Authority of the Archbishops of Canterbury, 1772 Pegge, in arguing that one should not look for coins ‘of the British princes that flourished after the Romans had left the island’ writes: ‘Mr. Speed indeed has complimented Uther Pendragon with a single piece, and as I do not at present recollect to have seen it anywhere disproved…I shall take the liberty of bestowing a few words upon it. A further reference is in Gough’s 1789 edition of Camden’s Britannia where, in quotation from Pegge’ (unpublished otherwise), the coin is referred to as ‘since lost from the Cotton collection’ and, with certain others, as being of dubious authority’, Gough gives as reference Pegge’s Assemblage and a manuscript of Pegge’s then in the Cotton library entitled ‘View of the Anglo-Saxon Coins’. Mrs. J. S. Martin has kindly supplied a further published reference. Beale Post, in his Gaulish and British Coins 1859, writes: ‘to these Speed adds a gold coin of Uther Pendragon, engraved in his Hist. Of England p.315 which is in all probability a forgery.’ There is also a passing reference to it in British Numerology Journal xxxvii, 312, where its authenticity is not questioned but where it is regarded as ‘probably a barbarous solidus of Virtus type (?Suevic)’. Miss G van der Meer and Mrs. Martin have been at great pains to help us to make a detailed comparison of the several manuscript catalogues of the Cotton collection, the latest of which is in the hand of Samuel Pegge. Three, two in the British Museum and one in a Dutch archive, belong to Cotton’s lifetime, and, though there are minor inconsistencies, give a remarkably clear picture of the composition of Cotton’s cabinet of Anglo-Saxon coins. In none of these is the Pendred included as being in the Cotton collection. Mrs. Martin has pointed out, however, that there is a heading in the British Museum manuscript reading PAENDRAED but with no illustration or text below it. We are grateful to both these ladies for making available to us the results of their research in this matter. Ruding, who discusses at length the then vexed problem of whether or not the Anglo-Saxons struck gold coins, makes no mention of the Pendred. Nor does Haigh in his paper entitled ‘Miscellaneous Notes on the Old English Coinage’ where the same problem is reviewed. Karl Morrison has recently published in Speculum (xxxvii, 592 ff.) a gold Carolingian medallion in the Berlin collection that has a somewhat comparable standing figure on the reverse. This he dates between 823 and 830 in which case it cannot have influenced the type of the Pendred, which, as will be seen, must be a quarter of a century earlier. Of what Country and period is it? The piece under review bears, as has been seen, the name of no ruler but has on each side the word Pendred, followed on the obverse by the letters MUNITARE (moneyer). Pendred may be taken as the name of the moneyer. This is an unusual though recognised, Anglo-Saxon name. 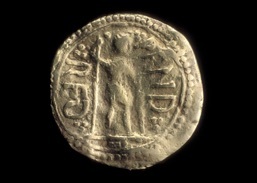 The two elements are well documented: PEND- in names such as Penda, king of Mercia, and –read in such names as Æthelræd; but Scarle only records the combination from a moneyer’s name on coins of Offa..
1.Information kindly supplied by Miss M. M. Archibald from a report by Dr. Werner of the British Museum Laboratory. 2.Using the table published in NC 1887, 308, which, however, it must be emphasised, assumes the only alloy to be silver. 3.We would like to take the opportunity of this paper to correct the weight of the Edward the Elder gold penny given in BNJ xxv, 227. M. Colin Martin has since kindly informed us that the correct weight should be 74.1gr. If a coin, was it intended to be a specific denomination? It is worth noting that Prou concluded that the existence of a few gold coins of Charlemagne and Louis the Pious in no way altered the general fact that the currency of the empire was at this time monometallic. These coins did not, in his view, form part of the Carolingian system of currency. 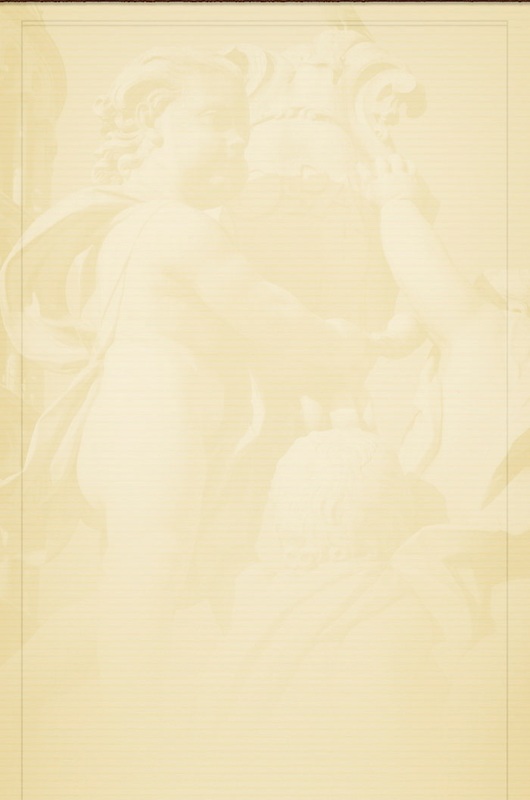 Catalogue des monnaies carolingiennes. See, for instance, P. Grierson’s ‘Carolingian Europe and Arabs: the myth of the mancus’, Revue Belge de Philologie et d’Histoire xxxii (1954), 1059 ff. It will be seen from Dr.Werner’s and Mr.Organ’s report that the specific gravity of the Pendred is 18.8, which suggests a gold content of at least 96%. This compares with a specific gravity of 18.2 of Offa’s dina, equivalent to approximately 93% pure gold. The weight of the two coins are 57.8 and 66.0 gr. respectively and, if one adjusts the latter to take account of the lower specific gravity, one reaches a weight in metal comparable to the Pendred of 63.9 gr. The Ciolheard, whose specific gravity is not available to us, weighs 63.6 gr. In any attempt to assess the possible value of these coins in terms of silver pennies we are handicapped by our ignorance of the ratio of gold to silver at the end of the 18th century. It is known that some seventy years later the ratio in France was 12:1 or, in the case of gold not pure enough to be used for gilding, 10:1. We are not aware of the exact purity of fine gold at this time; later it was 23 carat 3.5 grains of gold to .5 grains of alloy, equivalent to 99.48% pure gold. If this rate was applicable in the time of Offa, the lower-grade gold could be approximately 83% pure. This suggests that the Pendred was aiming at the fine standard, though not quite achieving it. The weight of Offa’s silver penny in the first group appears to have been something over 19 gr. ; perhaps the standard was in fact 20 gr. In his latest group it was raised to something distinctly over 20 gr. If it could be established that the ratio of gold to silver was 10:1 at the end of the eighth century, one could confidently accept these coins as mancuses of thirty pence. But it is, unfortunately, not possible to do so. But whether a mancus or not we feel convinced that both the Pendred and the Ciolheard were intended to be coin, struck probably, like the gold coin ordered under Eadred’s will for the specific purpose of making alms either to English churches or to the Holy See in Rome. We have had the opportunity, in the course of preparing this paper, of discussing its problems with a number of scholars besides those mentioned above. In particular we are indebted to the late Sir Frank Stenton and to Professor Whitelock for the interest they have shown and the help they have given us from the time that this coin was first rediscovered, to the late Mr. Albert Baldwin and to Dr. D. M. Metcalf and Mr. Ian Stewart for a number of helpful comments and suggestions. Is it a coin and what was its purpose? In considering the precise nature of the Pendred piece one comes up once more against the question that has vexed numismatists so long, and is still vexing them, namely the extent, if any, to which gold circulated in this country after the introduction of the penny. Wills show clearly that there was a substantial quantity of gold in England in Anglo-Saxon times, chiefly it would seem, in the form of ornaments. Though the constant reference to mancuses of gold are, in many case, likely to be to weights rather than coins, there are instances, such as the well-known one of King Eadred’s will where coin is not only specifically ordered to be struck. The coin disposed of under this will cannot therefore have been ‘bezants’ or diners. In a Latin paragraph, to which Professor Whitelock has kindly drawn our attention and which she dates ten years or so earlier than Eadred’s will, Æthelric gives the king Quinquaginta nomismata auri cocti. This term must surely indicate coin, though in this case there is nothing to show whether it was locally made or imported. 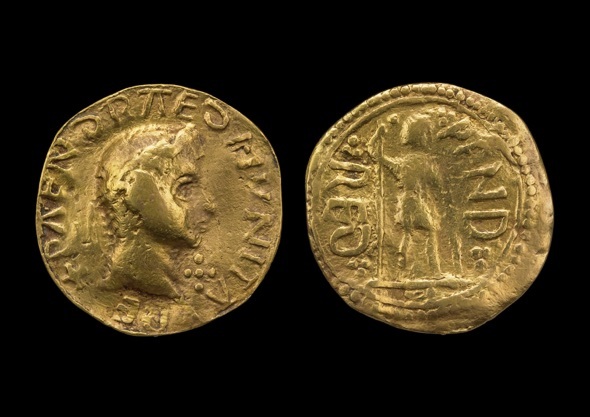 Hoard evidence of gold coin in the Anglo-Saxon period is, however, negative and it can safely be asserted that, even if struck in limited quantities, it never circulated as part of the normal currency of the country. This is no place to go over ground that has been the subject of much scholarly discussion in recent years. But it can be said with confidence however that the existence of gold coin in later Anglo-Saxon times is supported by documentary evidence and that the view generally held today is that they were made primarily for ceremonial purposes, such as the giving of royal alms. In earlier times there is the evidence of Offa’s vow to send 365 mancuses each year to the Holy See in Rome, and it is clear from the letter from Pope Leo to Cœnwulf, King of Mercia, that it was, at least for a time, fulfilled. Opinions differ as to whether Offa’s dinar was one of the mancuses sent to Rome. Its very existence, however, and the fact that it is undoubtedly a coin and shows no sign of having been mounted provides irrefutable evidence that gold coins were made in England in the time of Offa, even if only on a limited scale. There is nothing inherently impossible in regarding Pendred’s piece as a coin, but before accepting it as such, one must take into account the fact that it bears no regal name. That it has, at some time been mounted need not unduly worry us: this seems to be overridden by the fact that it is struck, which would hardly be the case were it designed to be an ornament. 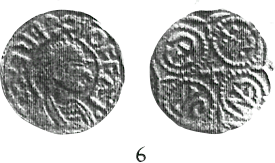 Had Pendred been on of Offa’s earliest moneyers, one might have explained the absence of the king’s name by regarding the piece as transitional with the anonymous sceatta coinage. It seems clear that Pendred operated in Offa’s middle period only, so that this explanation cannot be sustained. The combination of this evidence leads us to the conclusion that the Pendred should be regarded as a coin, though the question whether it is a regal issue or not must, for the time being, be left open. Since this paper was laid before the Society, the piece has been submitted to the British Museum Research Laboratory with a view to ascertaining whether it was struck or cast. Their full report is printed here as an Appendix and from this it will be seen that an unqualified verdict is given in favour of striking. The gold is of high purity, approximately 23 carat. We are greatly indebted to Dr. Werner and Mr. Organ for the interest and care they have taken over this investigation. The edge suggests that the piece has at some time been mounted. Whether this was done in ancient times or by a later owner cannot be established. It would, however, not be unreasonable for it to have been done in Anglo-Saxon times since gold was not generally in current circulation as coin after the introduction of the penny. Letter from the British Museum. Anna Gannon of the coins and medals department of the British Museum commented in a letter to Christopher Pendred. The gold coin remains unique. We have one of the coin by the Moneyer PENDRED, illustrated on plate XV, no 9 of the Blunt & Dolley article, but it is certainly not similar, as it is a silver penny. The legend on this coin is actually RENDRED but is undoubtedly the same person. Apart from the five specimens (all silver pennies) recorded in the article, there are five recent single finds of coins by the Moneyer Pendred recorded on early mediaeval coinage database. (For further information, access the EMC data base online, search for Fitzwilliam Museum, Cambridge, coins and medals. All the coins are illustrated). You asked about Moneyers. A moneyer seems to have been a guarantor of the quality of the coins, and he may or may not have also been the die cutter, actually preparing the die from which coins would be struck. We do not know anything about early Anglo-Saxon moneyers, but we do know about St Eligius, a Merovigian (French) moneyer, who started his career as a jeweler, was noted for his honesty and became Moneyer, and eventually was made Bishop. You might like to read ‘The London Mint and the Coinage of Offer’, by I. Steward in M.A.S.Blackburn (ed) Anglo-Saxon Monetary History. The letters MVNITARE following the name may be taken to be the OE. word Mynetere, moneyer. The V in place of Y is of common occurrence; Bosworth gives a form with I in place of E – Miyniteri; the only letter, which is unexpected, is the A in place of the E.
When we first saw the Pendred, we realized at once that it was something so entirely new that it would have to be subjected to the most critical examination before it could be accepted. We both independently expressed the view that, if an early record of it could be found dating before the time of the more skillful forgers, the case for its authenticity would be greatly strengthened. We had not dared to hope that a reproduction would be found dating from the early years of the seventeenth century. This strongly supports that case. If, however, it is a forgery, one is justified in asking what it purported to be. That it was not attempting to posture as a coin of the time of Offa, one can accept. It does not bear his name and the attribution has not been suggested until now. Nor, one would suggest, was it attempting to fill a gap as a piece of Uther Pendragon. This indeed was the attribution made by Speed, but a sixteenth or early seventeenth century forger, had such an intention been in his mind, would, surely have made it more clear in the inscription. Regardless of its purpose, which is now to be discussed, we have no hesitation in accepting this piece as a product of the time of Offa. It will be seen that on the first and third coins the two forms of d and D occur on the reverse of the new piece found, and that on the third the second (but not the first) element, is spelt as on the obverse of the new piece. If the reverse of the fourth coin is viewed sideways the general similarity of the layout (and of the lettering in particular,) will be apparent. The types and general fabric, with the bust in relief following the Roman model bear, however, no relation to any known coins of Offa. c.787- c.792. We therefore agree with Pegg’s attribution of it to the Anglo-Saxon series but put it two centuries earlier than he does. 1. What is the Prototype of the Pendred piece? 2. Of what Country and period is it? 3. How is the obverse legend to be interpreted? 4. Is it struck or cast? 6. Is it a coin and what was its purpose? The British Museum in London can supply high quality prints of the Pendred coin. We are not authorised to publish their contact details on this website. Please e-mail me at pendredlines@gmail.com. and I will send you contact details so that you can request a photograph of the PENDRED coin ref:1962, 0313.1 (copyright the trustees of the British museum).